NEWPORT, R.I., September 7th, 2018 — Rhode Island based Marine Technology firm PowerDocks joined Teledyne Marine Systems of Systems Approach to Underwater Mine Countermeasures demonstration held at The Naval Undersea Warfare Center (NUWC) Division Newport during the 2018 Advanced Naval Technology Exercise (ANTX) Human Machine Interaction (HMI) showcase held Aug. 30-31 at NUWC Narragansett Bay Test Facility. PowerDocks BlueIsles™ Autonomous Floating Microgrid (AFM) platform served as a stationary source of renewable energy generation, power storage, and in-situ electric distribution to recharge drone devices operating in the aquatic domain. PowerDocks BlueIsles™ AFM platform offers the option to feature wireless power distribution devices in its platform designed to recharge Air Drones landing on its deck, Autonomous Surface Vessels (ASV), Autonomous Underwater Vehicles (AUV), and other suite of Environmentally Sensing and Data Telecommunication devices. Teledyne Marine showcased a Teledyne Oceanscience Z-Boat USV launching to start a bathymetric and Light Detection and Ranging (LIDAR) survey from PowerDocks BlueIsles™ AFM platform. 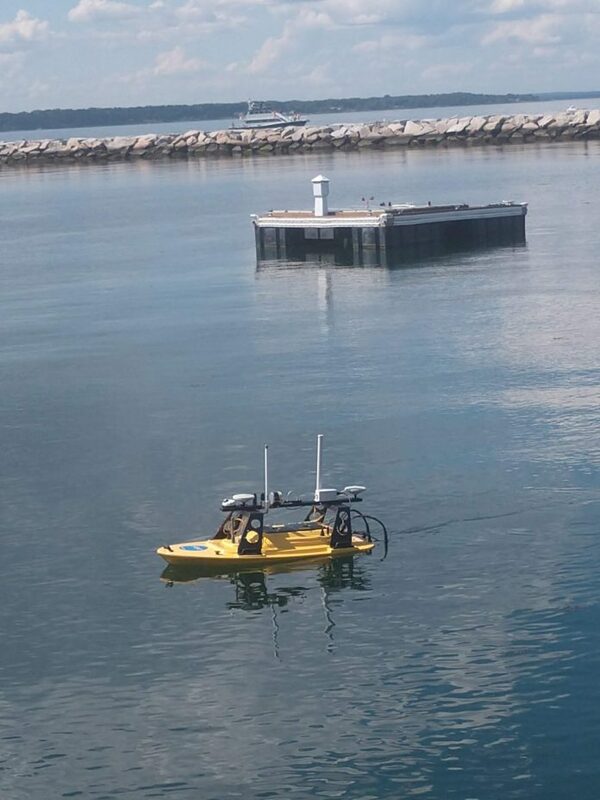 The Marine Advanced Research WAM-V®ASV, station keeping in the area, launched a Plank Aerosystems Autonomous Unmanned Vehicle (AUV) to track the Z-Boat from the air. A Teledyne Gavia AUV conducted a search-classify-map side scan survey with Teledyne Caris’CARIS-Onboard mosaicking data in real time and passing images to Charles River Analytics for Automatic Target Recognition (ATR). After all vehicles completed their surveys and mine-like-objects were detected, the coordinates were passed to the WAM-V®ASV. The WAM-V navigated to the coordinates and deployed a Teledyne SeaBotix ROV. GreenSea Systems’ Smart Flight navigated the ROV to the target aided by the Teledyne Benthos USBL and neutralization was successfully demonstrated. ANTX HMI 18 was the largest ANTX event hosted at NUWC Newport in terms of the number of participants, vehicles, and technologies since the exercise series began in 2015. This exercise involved more than 55 participants from industry, academia and government as well as fleet personnel who provided critical feedback to participants. Consistent with the human machine interaction theme, participants identified science and technologies that enable or achieve coordinated detection, localization, tracking and/or targeting for undersea, surface and air environments. With this focus in mind, the exercise explored ways in which these technologies enable human trust in machines to support operational decision making. For more information please visit www.power-docks.com.